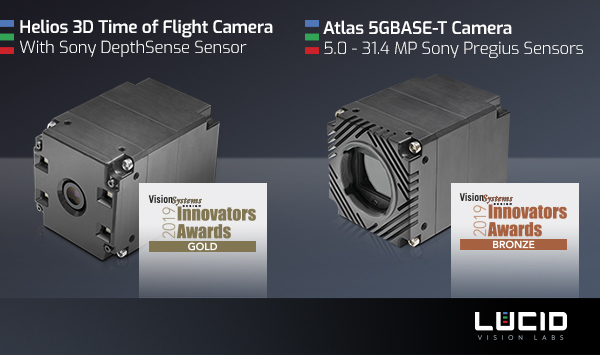 Chicago, IL – April 8, 2019 – On April 8, LUCID Vision Labs, Inc., a designer and manufacturer of industrial vision cameras, was presented with a gold-level award in the “Cameras – 3D” category at the Fifth Annual Vision Systems Design Innovators Awards presentation, held during Automate in Chicago, IL. LUCID’s HeliosTM 3D Time of Flight camera was recognized by a panel of esteemed experts from system integrator and end-user companies. In addition, LUCID has also received a bronze-level award in the “Cameras – visible” category for the AtlasTM 5GBASE-T GigE Vision camera.